Chevrolet is paying tribute to its outgoing, fifth-generation Camaro with a new Commemorative Edition, which will debut at next week's SEMA Show in Las Vegas. 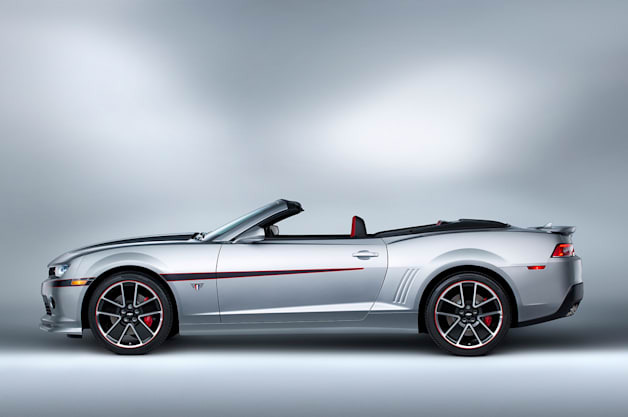 This particular muscle car, while being shown as a convertible, will also be available with a fixed hardtop. Available in both V6 and SS V8 varieties, the Commemorative Edition Camaro follows in the well-established tradition of the fifth-gen's many special editions by adding a flurry of aesthetic treatments without much in the way of performance changes. That said, it looks pretty good. Unique 20-inch wheels that remind us of some of Hurst's classic efforts for GM, a body-color front splitter, the rear spoiler from the ZL1, a bespoke stripe pack and, of course, Commemorative Edition emblems spice up the Camaro's exterior, while the cabin is home to eye-searing Adrenaline Red-and-black leather upholstery, with red contrast stitching and other accents scattered throughout the interior. A leather-wrapped, flat-bottomed steering wheel is a nice touch, as well. 2015 Chevy Camaro Commemorative Edition is the fifth-gen swan song originally appeared on Autoblog on Sun, 02 Nov 2014 00:01:00 EST. Please see our terms for use of feeds.